This low air loss mattress with raised edges made in USA has unique built in bolsters to promote a safer environment without compromising the patients sleeping area. This medical air mattress is designed to effectively manage moisture, shear, and friction while redistributing pressure. Built in low air loss therapy is designed to protect and heal the skin. The user friendly pump (included) supports up to 400 lbs and heals up to stage 4 pressure ulcers. The pumps features include true low air loss to keep the patient cool and dry, auto firm to assist with patient transfer, and seat inflation for additional support. This low air loss mattress offers ultimate comfort, healing , and safety incorporated into one complete medical air mattress system. 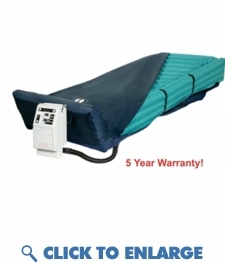 5 Year warranty makes this low air mattress ideal for long term home health care. This low air loss mattress with raised edges made in USA has unique built in bolsters to promote a safer environment without compromising the patients sleeping area. This medical air mattress is designed to effectively manage moisture, shear, and friction while redistributing pressure. Built in low air loss therapy is designed to protect and heal the skin. The user friendly pump (included) supports up to 400 lbs and heals up to stage 4 pressure ulcers. The pumps features include true low air loss to keep the patient cool and dry, auto firm to assist with patient transfer, and seat inflation for additional support. This low air loss mattress offers ultimate comfort, healing , and safety incorporated into one complete medical air mattress system. Recommended for patients with any stage pressure ulcer, myocutaneous skin flaps and skin grafts.